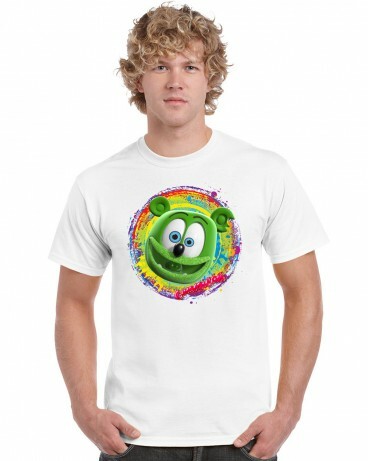 New Gummibär T-Shirts Available - Gummybear International Inc.
Gummybear International has announced that new Gummibar t-shirts have been added to the Gummibar webstore, just in time for the begining of summer. The new Gummibar t-shirt features a brand new design featuring the internationally-known animated singing and dancing cartoon character. The shirt is available in adult sizes small through XL, only at the Gummibär Shop at www.gummybearshop.com. The youth t-shirt size will be available soon. Gummybear International is engaged in the creation, development, and branding of animated entertainment properties, as well as musical content based on and produced for such properties. It markets and sells recorded musical and video products in various physical formats, such as compact discs and DVDs, and digital formats, such as downloads and ringtones, through a worldwide network of established distributors and licensees. The company’s music publishing segment owns and acquires rights to musical compositions, markets these compositions, and receives royalties or fees for their use. It also is actively developing mobile and computer based games and exploiting merchandising rights for its brands in cooperation with a variety of licensing partners. parental locks GBI is working on a number of film and TV projects. The company is headquartered in New Jersey.